Sauerkraut is a fermented food that lasts up to two months in the refrigerator as long as it is in a sealed container. Frozen sauerkraut lasts up to two years in the freezer while canned sauerkraut has a shelf life of up to two years. "Sauerkraut" is directly translated as "sour cabbage," and it is made by fermenting finely sliced cabbage in a brine that includes beneficial bacteria. It is a hearty food that contains high amounts of vitamins B, C and K. It is also high in calcium and magnesium. 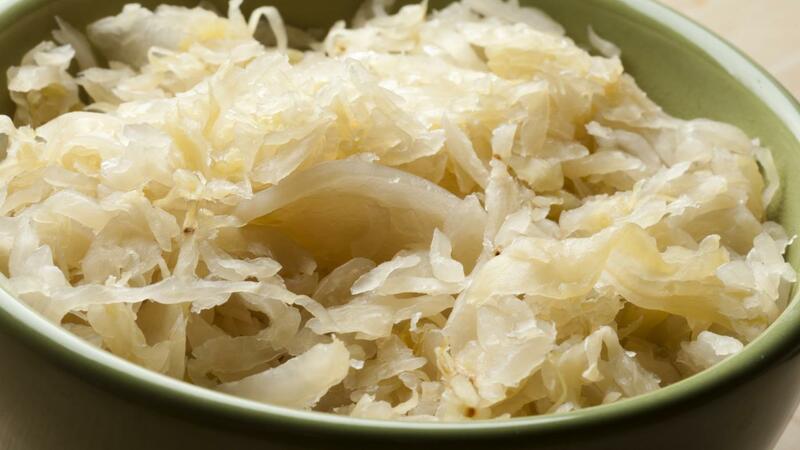 Sauerkraut aids in digestion and provides a healthy source of fiber, making this versatile garnish a perfect addition to sandwiches and salads. How Do You Store Onions in the Refrigerator? How Long Will Potato Salad Keep in Refrigerator? How Do Pasteurization and Canning Help Preserve Food? What Is the Difference Between Freezer Paper and Wax Paper? How Do You Build up a Good Emergency Food Supply?